ThisIsMyNext posts some interesting news out of the Samsung camp. After Apple requested to see some of Samsung’s unreleased products (most of which were publicly released before the judge granted the motion), now Samsung is requesting to see some of Apple’s unreleased products. Namely the iPad 3 and the next iPhone whether it be the 4S or the iPhone 5. Obviously, very few people have seen these unannounced products. In the unlikely event that Samsung gets access to Apple’s products, it will only be Samsung’s legal team that gets to see the devices. Samsung’s manufacturing team probably already has some pretty good knowledge of the new products since they are bidding on/building some of the most important parts. Nilay Patel, a former copyright attorney himself, thinks that this is a move to reignite negotiations between the companies. If that is true, Apple seems content to let the disagreements go to court and let a judge/jury decide. I think it’s a calculated gamble for additional leverage. Apple and Samsung held negotiations for a year before giving up and heading to the courts, and I’m reliably informed that there haven’t been any substantive settlement discussions since Apple first filed its complaint. That means talks have been at a standstill for a long time now, and I wouldn’t be surprised if Samsung was trying to put some additional heat on Apple to try and kick negotiations back into gear. It’s an interesting and aggressive move in its own right, but it also highlights the fact that neither Apple nor Samsung have addressed the actual merits of their complaints in formal replies — this is a minor skirmish before the real battle begins. 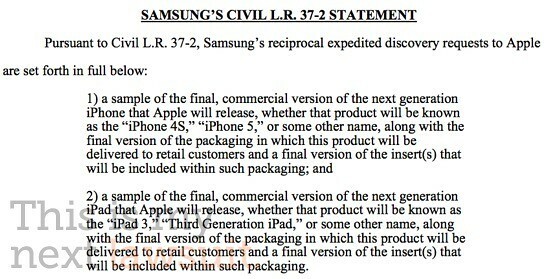 We’ll see if this sideshow accomplishes anything beyond clever lawyerly maneuvering, but for right now it’s clear that Apple and Samsung aren’t planning to back down anytime soon. Still, it’s fun to watch the fireworks! In my opinion it isn't likely that the court will grant samsung anything since it granted Apple the right to see all of Samsungs newest devices. If Apple sees any similarities they will be mentions in the trial and Samsungs devices will be stopped dead in it's tracks unless Apple agrees to a licensing of their patents to Samsung(which we this is extremely unlikely to happen).